At Loads of Vans, Wilsons’ dedicated van base in North Cheam, Surrey, you will discover the biggest and most successful van centre in the South of England, where we are proud to offer outstanding deals to our customers. We are able to buy vehicles in bulk for less and pass these amazing savings on to you, our customers. This competitive pricing, along with our quality products and professional customer service are the reasons why 80 percent of our business comes from repeat customers and recommendations. 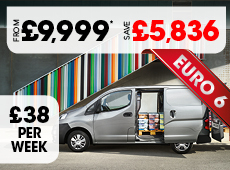 Our prices are simply unbeatable – we supply the cheapest new vans in the UK. We have a great choice of finance lease, hire purchase and contract hire deals, so you can choose an option that works for you. Keep an eye on this page to discover our most up-to-date deals and ensure you don’t miss out. Our franchises cover many of the leading brands, including Citroën, Fiat, Nissan, Peugeot, Renault and Vauxhall, and we have over 300 vans in stock. We also deliver across the whole of the UK and you’re eligible for free delivery straight to your door if you are located within 20 miles from us.